They Said It Was Impossible is a series of Bible studies based upon Counties evangelist Clive Cornish’s inspirational adventures walking, climbing and marathon running with a 12×6 foot wooden cross. Stunning photography captures the excitement of these unique journeys while engaging narrative and relevant Bible passages develop themes inspired by these real events. The first walk started from Clive’s home in Cardiff, Wales. There was no fuss, no send-off committee and his wife and children slept peacefully upstairs. After praying he opened the front door, shouldered the cross and headed west down the A48. The cross was made of solid wood, measured 12ft x 6ft and weighed almost 50lb. Over the next four weeks Clive would walk almost 500 miles around the circumference of Wales to tell the people of Wales that Jesus died on a cross, similar to this one, because of His love for them. Before leaving home Clive’s friends and family told him, “It was impossible.” But despite the physical hardship the walk was completed in four weeks. 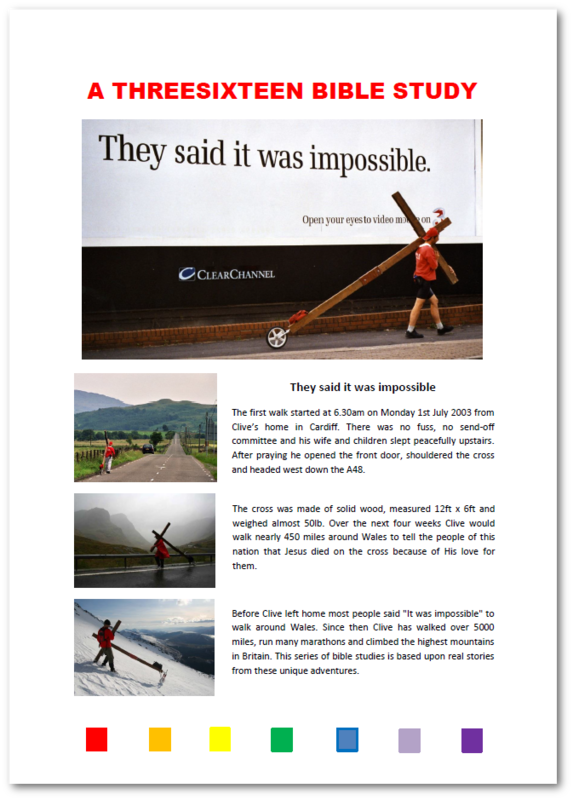 As Clive returned to Cardiff he walked under a billboard which read “They said it was impossible.” Reminding Clive that “what is impossible for men is possible with God” (Luke 18:27). Since then Clive has walked over 5000 miles, climbed Britain’s highest mountains and completed a number of marathons and half marathons – with the cross of course. The studies are introduced by Clive through a video, followed by introductory questions, Bible passages and study questions which help you explore the text. A final short video highlights relevant points, applies the lessons to life and draws the study to a conclusion. An accompanying booklet is also provided – if desired the booklet can be printed.